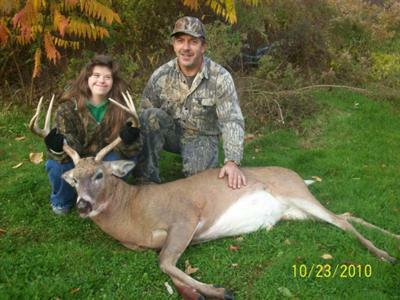 my 2010 archery buck 208 lbs. 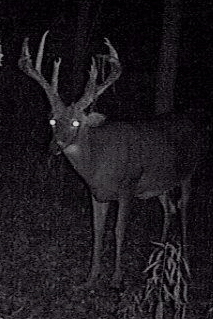 After my trail cameras took videos of two monster bucks on my property, I nicknamed him the "Devil Buck" because the nightime trail cam videos had his eyes glowing and he had a devilish look to his antlers. 2 1/2 years old. I saw my buck near the end of archery season at about 55 yards away (too far for me). A neighbor ended up getting the other monster buck, but his rack had three broken points on it. The videos that I had of his buck in velvet made him alot prettier. Turns out my buck was seen several times running with his,so we assume mine broke his all up. Opening day found me in a tree about 1/2 mile from where I got the videos of him but at the place where I saw him during archery sesason. Fifteen minutes after first light I heard something running into my woods. I looked and saw a coyote that looked just like a timberwolf and a reddish coyote with him. As badly as I wanted to shorten their lifespan I didn't want to ruin my spot by shooting so early.